Attorney Alfredo has experience in deportation defense, citizenship, marriage and family-based petitions, fiance visas, conditional green cards, U and T visas, VAWA self-petitions for abused immigrants, adjustment of status applications, and 3 & 10-year bar waivers. Yes! Contact Me To Book A Free 1-1 Consultation! Yes! Practice Area Is Immigration 100%! Monday - Friday, 9am to 6pm PST and Saturday and Evening appointments may be available upon advance notice. Monday - Friday, 9am â 6:00pm PST and Saturday and Evening appointments may be available upon advance notice. Attorney Alfredo volunteered for the Coalition to Abolish Slavery & Trafficking (CAST), a non-profit organization in Los Angeles, where he helped obtain relief for victims of serious crimes and human trafficking through U and T visa applications under the Victims of Trafficking and Violence Protection Act (VTVPA). Alfredo also volunteered for New Hampshire Catholic Charities, gaining significant experience with refugee applicants. Alfredo graduated from California State University, San Bernardino with a Bachelor of Arts degree in Political Science in 2008. He became the first person in the California State University System to earn a Bachelor of Arts degree in Arabic Language, Literature, & Culture in 2009. He earned his Juris Doctor degree from the University of New Hampshire School of Law in 2012. During law school, Alfredo served as president of the Hispanic National Bar Association chapter of his law school and was a member of the Diversity Action Coalition. He also participated in the Uvaldo Herrera National Moot Court Competition in New Orleans, Louisiana. Alfredo is an active member of the American Immigration Lawyers Association (AILA). 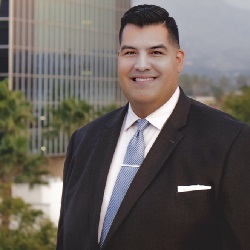 He currently serves as a State Advocacy Liaison for the southern California chapter, building relationships with state representatives in Sacramento. He reviews proposed bills related to immigration and analyzes which bills merit support from the chapter. Alfredo is responsible for communicating and creating relationships with state representatives so that they contact him when questions relating to immigration law arise. In December 2015, Alfredo was elected to the Board of the Immigration Law Section for the State Bar of New Mexico. The Immigration Law Section is responsible for sponsoring continuing legal education programs, advancing the quality of legal services, and sensitizing the public to the benefits of securing legal counsel for immigration matters. The son of an immigrant, Alfredo understands the U.S. Immigration system firsthand and is always willing to give back to the indigent immigrant community. In September 2015, he volunteered his services for Citizenship Day hosted by the southern California chapter of AILA and the National Association of Latino Elected and Appointed Officials (NALEO), where he helped low-income individuals apply to become naturalized U.S. Citizens. He regularly speaks at colleges and high schools across southern California, offering valuable immigration information to immigrant students and their parents. In addition to his work with AILA and the State Bar of New Mexico, Alfredo is a member of the American Bar Association, the Hispanic National Bar Association, and the Los Angeles County Bar Association. He represents clients in immigration matters in all 50 states. Alfredo was born and raised in southern California. He is fluent in Spanish and conversant in Arabic. He enjoys reading, listening to music, watching movies, traveling, and spending time with friends and family.